Welcome to the AVR ButterFly and Beginner's Site. A place for Butterfly Owners and Beginners. The AVR Butterfly is a credit-card sized demo board from the Atmel Corporation that is feature-packed and retails for about $20 USD. The Butterfly is a self-contained, battery-powered demonstration board running the Atmel AVR ATmega169v microcontroller with a variety of peripherals and ports. The Butterfly board includes an LCD display screen, a joystick, a speaker, an RS232 serial/modem/terminal port, temperature, light, voltage & Analog-to-Digital (ADC) sensors, serial EEPROM chip and internal EEPROM for data storage, multiple internal clocks and timers. The board has a shirt pin on its back and can be worn as a portable electronic scrolling name badge after you enter your own name. 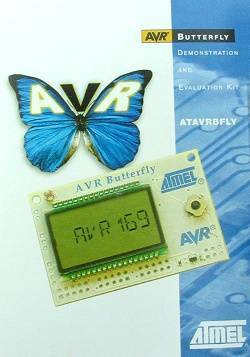 The AVR Butterfly comes preloaded with software to demonstrate the capabilities of the microcontroller. The factory firmware can scroll your name, display the sensor readings like tempurature or light levels. It can show the time. The AVR Butterfly has a piezo speaker that can reproduce music and sounds. The AVR Butterfly was designed mainly to demonstrate LCD driving capabilities of the 169V chip by running a 14-segment, 6 alpha-numeric character display. The Butterfly's ATmega 169v CPU/MCU is capable of speeds up to 8Mhz. It is factory set by software to 2Mhz to preserve the life of the button battery. Since most AVR instuctions execute in only one or two clock cycles, it's very quick. A pre-installed bootloader program allows the board to be re-programmed with a standard RS-232 serial plug and cable. The Butterfly can be re-programmed using either Assembler or C with a free download IDE from Atmel.